Last season, one of things we heard about was how confusing our discount schedule was. Well, we are fixing it. We have been listening to your comments and suggestions and have found that many of you who make reservations that qualify for a group discount end up needing to add a person or two to the roster by the time your trip launches. reservation at a discounted rate. For 2007, we have simplified the process and made adding the inevitable extra person to your group reservation a seamless task and it allows add-ons to take part in your group discount as well! It is simple: Groups of 12 or more booking any Lower or Upper Kern trip (excluding Saturday starts) are eligible for a 15% discount on the reservation. The only requirement is that your deposit and/or balance due be received via one check or credit card. If you have an additional person or two that would like to join your group anytime after your initial booking, we’d be happy to add them AND apply the 15% group discount afforded your initial reservation. We hope this new system addresses your concerns and makes booking your group and adding that additional person a much simpler affair. We also changed our rates for families. In an effort to make it easier for families with kids to join us on all sections of the Kern at a reduced rate this year, we are offering a 10% Youth Discount” this season. This reduction in trip fare is applicable to kids aged 16 and under and can be applied to any trip we offer (excluding Saturday starts). 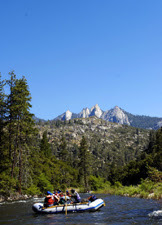 Kern River Outfitters has always prided itself on running fun, wholesome trips that suite families with youngsters, and we hope this youth discount also meets with your approval. Keep in mind that families with groups of 12 or more can upgrade to our 15% group discount on the entire entourage. 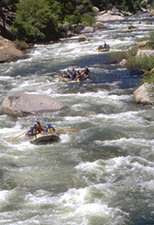 Give us a call @ 1-800-323-4234 if you have a group planning a Kern trip this year. I am certain we have a plan that will help you organize a great trip. Posted by Luther Stephens.